Smith, Digby. 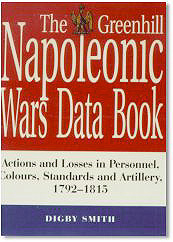 The Greenhill Napoleonic Wars Data Book. London: Greenhill, 1998. 592 pages. ISBN 1-85367-276-9. £40.00/$69.95. Hardback. This book is great! When you see it for the first time and look into it you will immediately realize that there is a lot of work, research and knowledge in it. It is an absolute "must" for the bookshelf of every Napoleonic scholar, enthusiast, and others interested in the period. The book is a vast compilation of most of the different clashes, engagements, skirmishes, and battles of the Napoleonic and Revolutionary Wars. It also includes the actions of some minor campaigns, many events of the non-French wars, and naval battles. No action was too small, for the book goes down to engagements between 100 men. This is the book you have to have if you need information about a battle quickly. However, the data is accurate and almost always complete. The period range dates from 1792 to 1815 and the structure of the book is a chronological listing of over 2000 events each presented in its own section. You can start in 1792 and wander through the years by jumping from one event to the next until the 24th of September 1815 (one of the many events after Waterloo). Every event starts with the name, the date, and the respective campaign of it in the title. Also included are the names of the previous event and the next action of the campaign. So you can follow easily a campaign by reading only the relevant items. You can see who fought against whom and who was the victor. A very useful part of the entry is information on the exact location of the action using modern locations such as road numbers and town names. Digby Smith also includes, some very extensive, Orders of Battles (OOBs). In these OOBs you can find the different units and their commanders, plus the number of guns and troops involved. Casualties are often shown in a very detailed manner, sometimes even by unit. And at the end of the event section there are further comments and listings of the sources of the information. You can often find the OOBs of the different French armies and their strategic missions at the beginning of a new year or a new campaign. There is also a table of comparative British, Prussian, Austrian and Russian commanders' titles and the different command levels. The book is also designed to be a research tool for the scholar. In addition to the extensive bibliography and a huge index, there are listings of other places where one can find more information and sources, such as museums and archives throughout the world. The book does not have pictures, maps, and complete descriptions of the different campaigns. But it is obvious that this was never the intent of the author. This information can usually be found in other publications. Here the data is what is important and Mr. Smith does an admirable job in collating it. The user of this book might ask how one person can collect this much information and how he/she can be sure that it is both accurate and complete. Even the author himself states that during his decades of research he had many uncertainties to resolve and that it absorbed much time. The experienced researcher also knows that there are often discrepancies between different sources. For example it could very well be that a specialist of a single campaign knows about one or two more small actions or he has OOBs that contradict each other or are different from others. Or one might need even more detailed information like maps, battle reports, OOBs from other sources or uniform descriptions. So don't be disappointed if your sources show different figures. This will always be the case by such amounts of information. It is obviously not the purpose of this book to be the last and final truth. The reader will use this book as a very helpful starting point for information on his search for more. The scope and detail of the information contained in this book will make it the standard that all similar books will be measured by. Because of the amount of information and the way the book is structured for ease of use, this book soon will be found on many bookshelves beside the other classic works of Napoleonic scholarship. © 1995 - 2009, The Napoleon Series, All Rights Reserved.